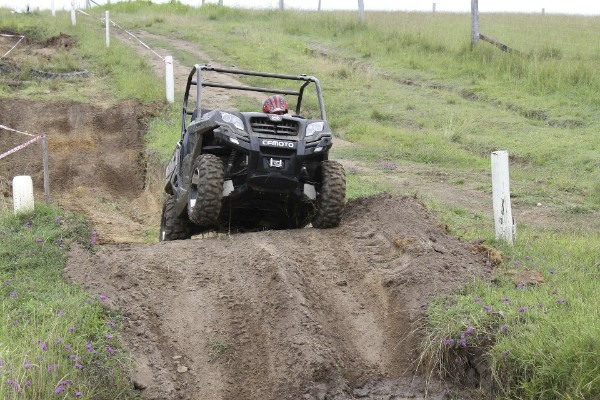 CF MOTO recently dedicated a series of ride days around the country to unveiling its ATV/UATV range for 2013. While CFMoto has only been in Australia a few years, like many Chinese brands its manufacturing history runs much deeper. At Cycle Torque we have tested many Chinese brands and found those with solid manufacturing experience like CFMoto have a definite edge in quality. My initial impression of each model before I rode it was the same – the design principals are very good indeed. Ergonomics and overall geometry along with the quality of finish make you feel like a lot of thought has gone into these models. That point is probably worth emphasising because the ride position and feel on the trails was a stand out across the board. When I asked the CFMoto guys about this, they put it down to an eagerness of their design engineers to listen and adapt with a short turn around. The CFMoto UTV range once again aims to punch above it’s weight. The model variants give you three different choices of engine – a 500cc carburetted single, the 600cc injected single and the larger 800cc injected twin. They are all easy to handle and come with CVT transmission – a gear selector with low and high range. I found the selector a bit sticky at times – perhaps because they were brand spanking new, I’m not sure. Consistent across this entire range is that almost every model is packed full of high end features as standard. We’re talking alloy wheels, independent adjustable front and rear suspension, push button four wheel drive, radio, winch, lights and mirrors. The integrated indicators is one thing that stands out for me. 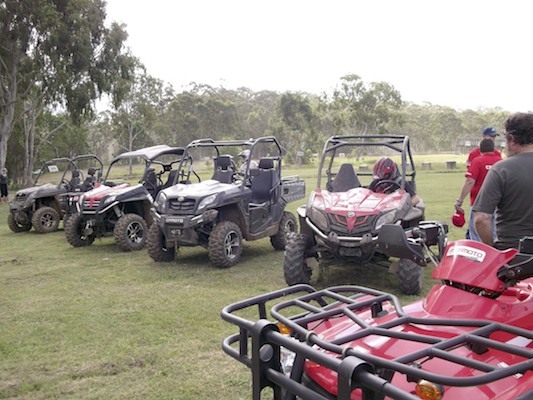 To get an ATV or UTV registered in NSW it needs indicators, so it is great to see manufacturers fitting these as standard. Big thumbs up. As for handling, all three models were up to the task of the heavy terrain and they all felt safe. The UTV range is going to be very popular on the farm where you need that mobility and added comfort of a proper seat.It may not be the best choice for the steep country but certainly around horse studs and dairy farms they will be very handy – especially with the cargo carrying capacity and tipper tray. Another big plus is the fuel capacity, a massive 27 litres available. 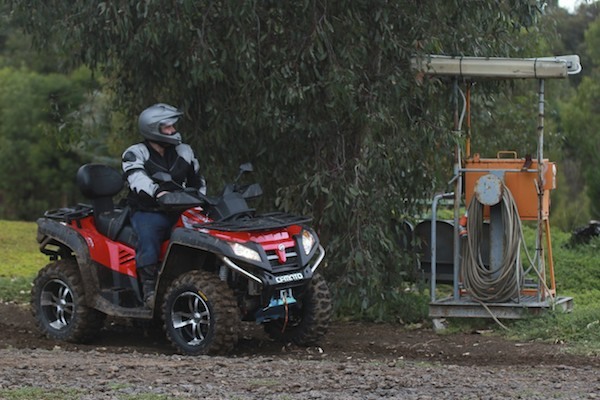 The base model for the CFMoto ATV range is the CF500 – but even the base model still packs a decent punch when it comes to features. There are no alloy wheels but you still get push button 4WD, indicators and a winch. Power comes from a liquid cooled 493cc single cylinder carburetted engine producing 35hp – more than adequate for work around the farm. The X-Lander and the ‘Farmer’ variant step up the action when it comes to features. They still carry the 500cc single cylinder engine but the extras are the stand out here. Bigger carrying capacity and comprehensive protection package especially on the Farmer model. Probably the most impressive model on the day was the X6. Apart from having the fuel injected 594cc single cylinder powerplant, the overall handling and finish of this ATV really impressed me. The ride was excellent and the suspension and brakes very responsive. 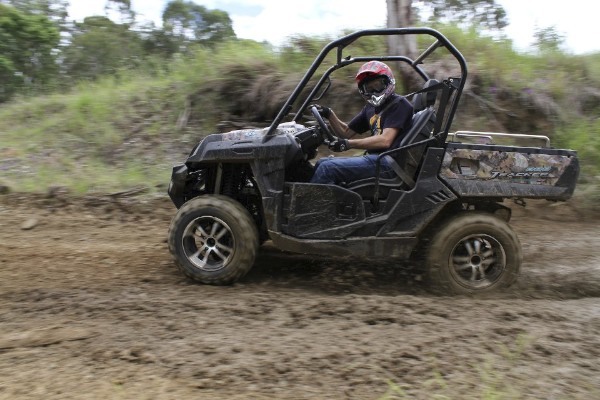 There are so many selling points on this quad apart from the price – the ability to take a passenger is another plus. Overall this is a product range that punches well above it’s weight. CFMoto already have a strong presence in Queensland and Victoria and look to expand into NSW more very soon.